The Official Publication of Elvis Presley Enterprises, Inc.
Two Great Issues A Year! 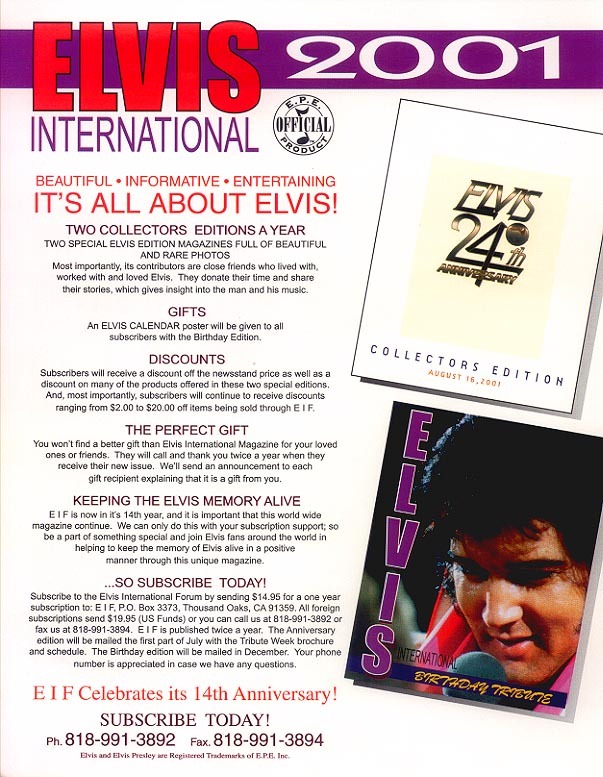 Subscribe to the Elvis International Forum by sending $14.95 (for a one year subscription to E I F, P.O. Box 3373, Thousand Oaks, CA 91359. All foreign subscriptions, add $19.95 (U.S. Funds). Write to E I F, or you may call us at (818)-991-3892, or FAX (818)-991-3894. Your subscription will start with the next issue, unless otherwise advised. E I F is published twice a year. Your phone number is appreciated, in case we have any questions. The Perfect Gift! You won't find a better gift than Elvis International Magazine for your loved ones or friends. We'll send an announcement to each gift recipient explaining that it is a gift from you.